Psalm 118 is one of the lectionary readings for the week. This week's Disciplines author, Pamela Hawkins used it today as the basis of her devotional. She talked about how she used to reject broken sea shells on the ocean shore because they were imperfect. At one point, though, she began to see the beauty in the broken. She says, "What had appear unappealing and imperfect to me, have been, in the eyes of God, treasures not to be rejected." Of course, she is talking about more than seashells. I hadn't seen this particular scripture in this light before. I had always heard it as referring to Jesus, when I now see that its application can be expanded. What in life do we reject because it is imperfect? Because it is flawed? Because it isn't "important" in our eyes? Children -- Sometimes we fail to listen, we fail to take the time to engage with them because we see them as distractions in the busy life we lead. In truth, they have a faith from which we can learn true worship. The poor -- Our Common Grounds service is attended by homeless, poor, addicted, marginalized people. I'm part of the Prayer Vigil team at our church. One of the things we do is to collect prayer concerns from members of the congregation. The people who attend this service submit requests each week. Reading their requests, I am struck by their huge needs but also by the many blessings that they list as reasons to celebrate. Opportunities -- Do we ever reject opportunities to serve God because we can't see the purpose in them? Do we ever choose to say "no" because it's a job that we think is "beneath" us? Do we ever say "no" because we think something is beyond our capabilities? I've been asked to participate in a ministry at church, and I'm debating what my answer will be. My biggest barrier to saying yes is that I'm just not sure that I would be any good at it. Am I short changing God? Or am I being realistic? Ourselves -- Do we ever reject ourselves or fail to have confidence in what we are able to do forgetting how God will equip us for his purposes? I have a friend who does not often speak in front of "grown-ups." She is a teacher, both in the world and in the church, and is especially gifted for dealing with children. She told me once, "I just don't speak in front of anyone over 10 years of age." One Sunday, though, she did. She did it for me -- her willingness to serve was placed ahead of her self-doubt, and she did a marvelous job. Sometimes we get those priorities out of order. 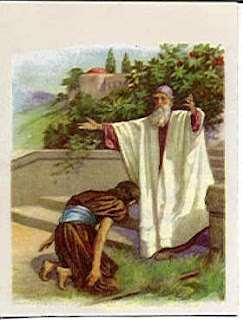 What is the stone that we are rejecting that God will use for his purposes? Harken, thou sulphurous nonentity, for you will see your pomegranates wither! We are all alive. We are breathing. Our hearts are beating. We walk, we talk, we go about life. We are alive. Notice that even the word doesn’t look very exciting, and my description of it is lackluster. Boring. Lent is a busy time of year in church. I feel like I am running in high gear. Adrenalin. Non-stop. It isn’t so much that there is so much to do, it’s that I FEEL like there is so much to do. We are made new in Christ. In Christ, we are ALIVE. On the way into work this morning, I picked up my iPod, and stuck in the earphones, so I was walking and listening. I don’t normally do that. The song that was playing was Unaware by Mercy Me. I looked around, and felt pulled to stop. Compelled to stop. The day was beautiful. 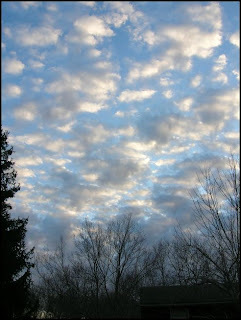 The sky was huge, the light from the sun was perfect, turning everything into mirrors, reflecting brightness. Even the grass was shining. There was a hint of fog in the far off mountains. I know what that means, now. Creation was shouting its praise to God, and He stopped me, and told me to watch and listen. Knowing you’re aware of me. Cause it feels so much like home. If you weren’t there to call my name and rescue me. I know what the song means. I lost track of time, I wasn’t even aware that I was breathing. I didn’t feel the weight of the 17 pound bag on my shoulder, and more importantly, I didn’t feel the weight of what I thought HAD to be done, right that minute. I was only aware that God was aware of me. The song ended, I came into work, and now I’m breathing! Now I’m ALIVE. And the funny thing is, everything that needed to get done, is done. 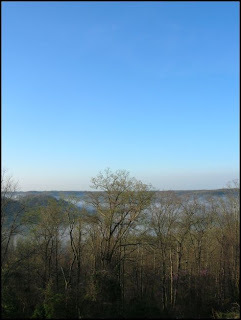 Images: All three of these images were taken this morning, as creation shouted His praise. Click on them to see them better -- the sunshine in the first one, how bright the grass is in the second one, and how huge the sky is in the third one. As part of what we are doing as an Emmaus group this season, we are preparing crosses. Two nails, wired together in the shape of a cross. (To see one, click here). I was making some tonight, while I was at Common Grounds -- I'm trying to get the 55 we need for a walk. They are made of masonry nails. Have you ever held a masonry nail? It's dirty. When you make these crosses, your hands turn black. One of the gentlemen in our church (Jim) came up to me and told me that I looked like I worked in a coal mine. Sometimes ministry gets you dirty. Changing diapers in the nursery isn't always the cleanest job, but it is necessary. When we baked bread for the Bread of Life dinner -- well -- let's just say I am not the neatest baker. Some women glow. I don't. I sweat, and I often get hot when I work at church. Ick. Sometimes ministry gets you dirty, but sometimes we are called to ignore the dirt. When our mission team went to Mississippi last year, I'm sure they didn't stay clean all the time. There is a couple (actually, more than the one couple) in our church who works in the kitchen every Thursday. I'm sure that they don't find it to be a clean job, but they are fulfilled by it. It is their worship. Their is a pair of brothers who are part of our church who clean the parking lot and grounds each Saturday morning. It's not a clean job, but it is one of their ministries. The problem with trying to stay clean in church is that we are not clean. We come to church covered in dirt, even though we appear to be spotless. Jesus, through his sacrifice, cleanses us, and then tells us to "Go forth and make disciples." He doesn't expect us to stay clean on the outside, and he takes care of the inside. We are called to get dirty, so that others can be made clean. And whole. 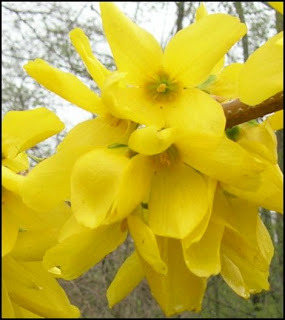 Images: I took a bunch of photos of forsythia today. Expect to see more as the days go by. 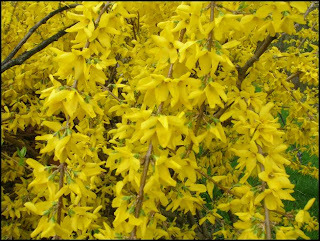 The second one reminds me that winter (pine) is turning into spring (forsythia). Someone in class asked tonight, "Can we really give people the gift of grace? Isn't that only a gift that God can give?" In the comment's section yesterday, Bob said, "In fact by definition I don't think we can really do more than reflect God's grace. " So what is the answer to the question? Can we give the gift of grace to other people? Jesus is the way in which we learn what God is like. To learn about God, look at Jesus. What is surprising to me is that we are how people today learn about God. Dwight L. Moody said, "Of one hundred men, one will read the Bible; the ninety nine will read the Chistian. If grace is unconditional, unmerited love, then the source has to be God. We are not capable of achieving this kind of love. We need God in order to offer grace. But how do we receive it? Everyday, we receive grace from other people. A friend gave me a birthday present this evening. It was a bookmark which says, "There are two ways of spreading light; to be the candle or the mirror that reflects it." (Edith Wharton). She then told me that I am both -- a candle and a mirror. I share that because what she gave me is not only a bookmark; she gave me grace. We do reflect grace. We are mirrors. But I do believe that God gives us grace in order for us to share it. We won't get it completely right. We won't love as he loves. We will however be able to love other people. God has no hands but ours. We are the means by which God shares his grace with his children. We are in partnership with God -- he has intended for it to be that way. We are to share God's love with his children. It is our purpose -- love God and love each other. The neighbor who lives across the street from us parks his van right behind our driveway. The presence of his vehicle makes leaving our house an adventure. Several mornings I have backed out of the driveway and wished he would find another place to park, removing the obstacle from my path. G has begun running track again. Tonight, he ran shuttle hurdles. The key to the successful navigation of these obstacles is rhythm -- run, run, jump, step, step, step, jump, step, step, step, jump, etc. The event was shuttle hurdles, which is a relay event. G was running the final leg of the relay. The runner who had run before him in the lane had knocked down one of the hurdles, and no one had sat it back up again. So as G came to the hurdle, it was wasn't there -- he ran through it instead of jumping over it. This completely destroyed the rhythm of the run, so as he finished running, he had the wrong number of steps between each hurdle. For him, the obstacle to succesfully running the race was the ABSENCE of an obstacle. Grace is Christianity's best gift to the world, a spiritual nova in our midst, exerting a force stronger than vengence, stronger than racism, stronger than hate. Sadly to a world desperate for this grace the church sometimes presents one more form of ungrace. Our unique gift to the world is grace, and yet we too often offer ungrace. What are the obstacles that get in our way of offering grace? Sometimes we value the rules over grace. We judge people (and ourselves) by the way we believe that they should be, rather than by giving them the grace that God wants us to offer them. Do we sometimes think that its wrong to be joyful? That laughter, happiness and a lighthearted attitude are anti-Christian? Do we sometimes think that we need to be un-joyful in order to be properly Christian? Are there times when we think we don't deserve grace? And isn't that ridiculous when you think about it? How could or would we expect to earn something that is given freely? Do we think we have to earn it? Does our pride get in our way? Do we want to "make it one our own" because we think that gives us value in God's or each others' eyes? Is guilt an obstacle to grace? Isn't time to move the obstacles? Isn't it time, as Yancey puts it, "for the church to become a nourishing culture of that grace?" Like sand on a rock. Than the air I breathe. I behold your power and glory. And I could love you. I will speak of your glory. The RevGalBlogPals blog is a group of women who are involved in or discerning a religious vocation. I am not part of that group, but I was interested in their "Friday Five" Meme this week. The question: I ponder the words of Isaiah and the relief and refreshment of a river in the desert.For this Friday Five, name five practices, activities, people or _____ (feel free to fill in something I may be forgetting) that for you are rivers in the desert." What are my rivers in the desert? I think it's an important question because it is necessary to know what brings us renewal -- what brings us refreshment -- what brings us closer to God. I thought to make it a little more challenging, I would change the question to What are my five practices, activities or people TODAY who are for me rivers in the dessert? Quiet breakfast -- Is there any better way to begin a day than with an unrushed breakfast? Our schedule was different this Sunday than it usually is -- we drove to another town close to our home for church. We didn't go to Sunday school, so we left home and drove to Panera. It was great -- breakfast with Steve and J, no rush, no worries. Just a relaxing time before church. Unusual. Worship -- We attended church in a small town near our home, but not at our regular church. A friend of ours (JtM) was preaching, so we went to hear him. It was a very friendly, warm church where we were made to feel completely at home. No surprise -- the sermon was terrific and the worship was real. A nap -- As a member of our church says, "Sometimes you just have to go to sleep." I've had a cold; after we got home from church, a nap was just what I needed -- renewal. Youth meeting -- We've (Steve and I) recently joined the youth leader team. The meeting tonight was small but fun, and it was interesting getting to know a few of the youth better. Dinner with friends -- In case you missed the birthday cake on fire in yesterday's post, yesterday was my birthday. I'm 43; it doesn't bother me to say it. I would rather be 43 than the alternative. For the third evening in a row, I had a birthday dinner. That's pretty special -- three dinners in a row! This one was with wonderful friends (JtM, MT and their daughter). Dinner, followed by coffee -- more importantly, an evening filled with laughter. What could be more renewing? Son home from New York -- G has been in New York on a school trip for the past few days. Late tonight he came home. I think he's taller, older and different than he was four days ago. I may never understand him again. That's not very renewing, but it is a relief to have him home, and to know that he is upstairs in his room, asleep. Oops. That's six! I guess any day when you can name six events that have been renewing is a good one! I attended a district training event today, and the first session I participated in was called "Planning Authentic Worship." The presenter began the session explaining the common misconception about worship, and what worship ought to be. I think it was the key to much of his discussion, and his description of it brought many thoughts into line for me. He said, and I've encountered this attitude, that we think of worship as a stage, with several "player" -- the worship leaders such as minister, music leader, choir, ushers, greeters, etc -- performing for the audience, who is the congregation. He said worship was actually something different. On the "stage" is the congregation, not performing, but worshipping. The audience is God, and the worship leaders are the prompters. The job of the prompters is to help the "actors" -- the congregation -- to do their job well. The role of the prompters is to inspire worship. This isn't a new concept for me, but it was explained very well by Don -- with great clarity. Hearing it explained so well brought several implications to mind. In a performance, do you "see" the prompters? No, not usually. Their role is to be almost invisible -- it is certainly not to be the center of the event. In worship, God is the center of the event, not the worship leaders, not the PowerPoint presentation, not the organ. When we see worship from the correct perspective, then we won't walk out of church judging the service. We leave worship hoping that we have done our job well -- that we have worshipped in a way pleasing to God. This kind of perspective requires that we accept responsibility as congregational members. We are not there to be entertained. We are there to worship God, and it will take effort on our part; effort that we are required to contribute. This perspective should function to make us less selfish in worship. If worship is not about 'me,' but is instead about God, then perhaps I will be more willing to be helpful. Perhaps I am more willing to place the needs of another congregational member in front of my own, so that that person can worship as well. I liked that Don started with this change of view, because everything after it -- the kind of music one chooses, the way PowerPoint is used, the role of response -- doing all of it well is dependent upon understanding this one concept. Understand it, and it all falls into place. 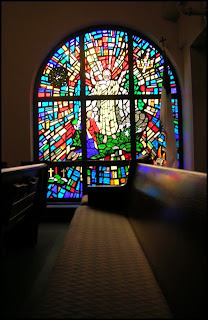 Image: Window in Kenova UMC. 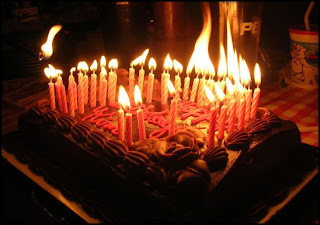 Second image - Someone's husband insisted that his wife's cake have the number of candles corresponding with her age. It's a wonder we didn't burn the restaurant down. I'm reminded of a scene from Murphy's romance. She is trying to get James Garner's character to tell her his age so that she can put the right number of candles on his cake. He says, "Just set the whole d*** thing on fire." Do you ever promise to pray for someone and then forget? I do. I try to solve that problem by praying at just the moment the request is made, while it is on my mind, but other times, the prayer needs to be done closer to an event, or more than once. Do you ever pray for someone, and feel like your job is done? "I said my prayer; I'm done!" Are you ever in a situation and feel God move you to pray? Last week, I was involved in our worship service -- involved meaning my attention was caught by it -- I was worshipping. At that moment, a friend came to mind, and I prayed. I wonder now if God triggered that prayer, and if the request was needed right then. A few weeks ago, I was in church, and the same thing happened, except that this time I was praying for the person right in front of me, who was delivering the sermon. The sermon was going well; there seemed to be to me no reason why the prayer was needed, but later that person told me that he had prayed during the sermon for God to be in control, so I think my prayer coincided with his, and I think God prompted my prayer. Why would that be? Why would God prompt me to pray for something he already knew about? Why would he ask me to pray for something that he was going to do anyway? I think the answer lies in a concept Yancey calls partnership in his Prayer book. He brought forth the point that God desires to be in partnership with his children to do his work in the world. He says, "from the very beginning, God has relied on human parterns to advance the process of creation." God wants so much for us to be in partnership, that he comes, grasps us by the shoulder, and says, "Pray. Pray now for this reason. Be my partner." The partnership binds so tight that it becomes hard to distinguish who is doing what, God or the human partner. God has come that close...the advance in intimacy is striking. 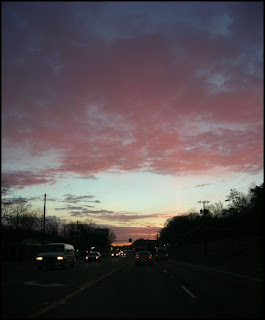 Image: Sunrise on the way to work the other day. I went to an Emmaus gathering last week. One of the ministers who is part of the community gave a pre-communion devotion. He talked about a friend of his who he went to visit one day. He walked into her house and didn't recognize her. She had been in a car accident (unknown to him). The airbag had deployed and left her face covered in abrasions. She looked terrible. She explained to him that while the injuries looked bad, the doctor told her that she would eventually be just fine -- that in time, there will be no scars. God justifies (makes perfect) then sanctifies (makes holy). God does what we cannot do so we can be what we dare not dream, perfect before God. He justly justifies the unjust. It's grace. We don't deserve it. We have no reason to expect it or to anticipate it. We are sinful, and there is nothing we can do to change that. God can. God does. Lucado says that "the finished work of sin is to kill the sinner." God doesn't allow that. If we choose to say yes, then he rescues us from death, transforms us, and justifies and sanctifies us. And those scars? All that sin does to us, all the pain, all the damage, all the scars, will be taken away. In a Sunday school class I was teaching, I was asked (and we discussed it in class) why Jesus kept the scars from his crucifixion after the resurrection. He could have had a perfect body. Why keep the scars? They were proof of who he was, for one thing. No one else has ever had scars from a crucifixion. I think they may serve as a reminder to him of what is was like to be human -- to bear pain and scars. Also, though, maybe it is a reminder to us -- he has the scars, so that we do not. In time, there will be no scars. 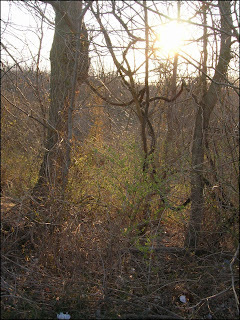 Image: Trees and light in the sunshine one morning at the VA.
Tonight is the last session of our class The Jesus I Never Knew. At the end of the class tonight, we will have met for fourteen times. In order to celebrate the community which has been formed among us, the work of God in our midst and any spiritual growth that has been achieved, Jeff the Methodist (who is my team-teacher) and I have planned communion. The purpose of the class has been to take a long, hard look at Jesus. What have been our misconceptions about him? What can we learn about him? How can that bring us closer to him? 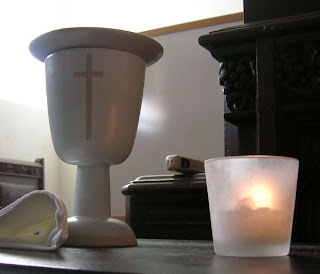 One of the members of our class is a retired minister, and it is an entirely wonderful thing that he has agreed to serve the sacrament. What a blessing. I've never done this before. I've never "set the table." As the class has been, the communion will be a sharing of the talents that God has given to JtM and me. I've baked bread (and I know I've mentioned before how God has taken simple baking and turned it into a gift). Jeff is bringing the grape juice. He arranged for Fred to serve, and has prepared the liturgy for the class. I've arranged the table. Team teaching has been full of the grace of combined gifts, and it is fitting that the communion is, as well. When I took the photo of the table, I used the timer on my camera, so that my pushing the "button" wouldn't jar the camera; the shutter would be open a long time since the lights were out. The timer on my camera has a little red light that blinks once per second prior to the shutter opening. The red light reflected on the cross. Next week we start a new class to examine another of Yancey's books, What's So Amazing About Grace. How wonderful it is to receive a preview tonight. Images: The table, set. The plate, awaiting bread, and the chalice. Candles lit. An expansion of Psalm 114. Even the footprints seem to dance in praise. From a land that was foreign to them. A land that become his dominion. And parts the seas for us. We are to be free. When we give ourselves to him. Creation celebrates the salvation of one child. The earth shakes, its low roar an undertone. As He brings forth new life. I'm getting ready to start working on the last lesson of our The Jesus I Never Knew class. Chapter 14 is called "The Difference He Makes." Did Jesus make a difference? Obviously, I would say that the answer is 'yes.' What difference did he make? One of the six impressions of Jesus that Yancey talks about is that Jesus was a portrait of humanity. I think I might understand this best if I call it a bridge. First, Jesus was a window for us to finally see God -- before Jesus, God's creation had no real image of who God was. We were meeting in class one week, and one of the tasks we were discussing was to look at the events of Holy Week and try to decide what we could learn about God from each one. One class member said, after reading about Jesus' trial, that she couldn't see God at all in this event. She could not see anything about God. I think the key to this exercise was to realize that if we look at Jesus -- how he acts in various situations, then we can see and understand God. Want to know what God is like? Watch how Jesus behaved. Jesus demonstrates for us God's nature. In addition, Jesus is a mirror. By looking at Jesus, we can see what humanity was meant to be. In Jesus, humanity is not distorted or degraded by sin. In Jesus, we see man as God created him. If we are made in the image of God, then Jesus reveals what that image should look like. But, as huge as that is, it that all there is? Where is the other end of the bridge? How did the coming of Jesus to the world affect God? Yancey put to words something that I have felt to be true for a couple of years. Through Jesus, God learns what it is like to be human. Because of Jesus, God learns what pain is like, what temptation is like. Because of that, Jesus becomes our sympathetic advocate. Yancey explains that sympathetic comes from the Greek root words syn pathos -- the feel or suffer with. Through Jesus, we learn what it means to be human, and God learns what is is like to be human. Through Jesus we understand ourselves, and who we were meant to be. Jesus becomes our advocate to God. Every 3 seconds, a child dies. As we sit, surrounded by them. Reminded by God of his children. Just as the dolls are. And we pass by them. And so God decided to make them visible. So that we would SEE them. These dolls are reminders of death's shadow. Younger than five years old. Their faces were lost behind the dolls. We become faceless as well. And in their faces, we see Christ. Another one dies, that we could have saved. indwelling all we know or think or do or seek or find? Love's echoes sound and God is found, hid in the common place. Open our hearts, dear God. Open our eyes to the needs of children. Open our mouths to speak for them. Through Jesus, we are made alive. So let's stand up, and act like it. Thanks to Rev. Carol Duffield, who spoke in our service, and who brought the dolls alive. She is the one who called the dolls "faceless" and then gave them names -- the names listed in the poem are names of children that are cared for and fed because of Upshur Parish House in Buckhannon. Thanks to Pastor Carol, from whom other images in the poem were collected. Pastor Carol is quoted in the last two lines. The italicized stanza is the first verse of the hymn, "How can we name a love" by Brian Wren. 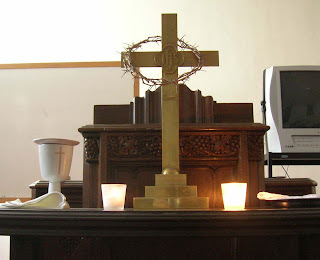 The images were taken today in church prior to or during the service (to see them in more detail, click on them). Our Youth once again participated in the 30 Hour Famine. 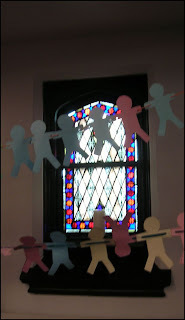 As part of that event, they learn about hunger in the world, and in response, cut out 1200 paper dolls -- each doll representing a child who dies from hunger and preventable disease each hour. During our hour of worship today, 1200 children died -- one every time you blink your eyes. 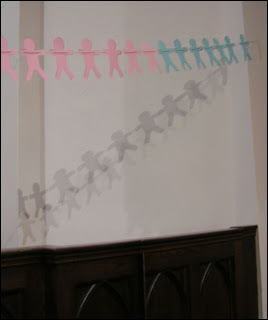 The youth are hoping that these dolls will be rescued by the congregation. As each dollar in support of the fight against world hunger is collected, one doll will be removed. One dollar can feed a child for one day. Luke 15:11-32, but what happened next? How could his father be so gullible? And it is available for all. Even for the younger son. Even for the older son. A look of astonished wonder in his eyes. And yet look what he has done for me. And not notice the wetness? Where was the arrogant brother who used to be? Where was the one who was so hard to love? And is it available for even the older brother. The father came into the room. And he saw the confusion on the face of his older son. Melting the heart of the lost son. And there is nothing that compares to it. And we stand amazed in the heat of its presence. We stand changed in its fire. And nothing about us is ever the same. *Taken from Frederick Buechner quote describing grace, "The grace of God means something like: "Here is your life. You might never have been, but you are, because the party wouldn't have been complete without you. Here is the world. Beautiful and terrible things will happen. Don't be afraid. I am with you. Nothing can ever separate us. It's for you I created the universe. I love you. There's only one catch. Like any other gift, the gift of grace can be yours only if you'll reach out and take it. Maybe being able to reach out and take it is a gift too." I've been reading a few blogs, and ran across one called "those damn women" on 42. He references another blog called Signposts, which has a post of the same name. The discussion in these two posts is a return to the idea that the attendance of men in churches is reduced because of the "feminization" of the church. I know, I know, I've talked about it before (in these posts), but these two entries I list above discuss it in a way that I hadn't thought of the issue before. The claim that is made by those who believe it is that men are avoiding church because it is too "feminine." I don't agree with this argument, but let's take it one step further. WHY is the church too feminine? Many churches today are still guided by male leadership. I thought about that for a while, and I made a list of the committees in my church. Are the chairman male or female? That's 17 people or positions. Nine of them are male and eight of them are female. I think that's a balanced split. I do think that we are heavy on the male side in administration and heavy on the female side in programming. I think that we are a progressive church in this area, and that in many churches, this would not be the case. Even in our church, which has an even split, men have a voice in the church leadership. If this is the case, and we are progressive, as I believe we are, then in many churches, the male voice would be even louder. So how is it that the church has become more "feminine?" Could it be that this is only an excuse? I think so. J: Mom, does that church own that house, or is it just that close? Me: That church owns that house, I think. It's their parsonage. Me: Churches have the responsibility of providing a place for their ministers to live, so churches own parsonages as home for their pastors. J: Does our church own a parsonage? Me: Yes, two of them. J? Are they for Joe and Carol, or Joe and Suzanne, or Carol and Suzanne? Me: Either one, but I imagine most churches buy them. They don't build them. J: Scott could build one. He's right. Scott is a member of our church, and one of his talents is building -- I'm with J; I think Scott could build anything, including a house. Why do I know that? Why is it that J knows that? We know Scott's talents because he makes a gift of them to the church, on a regular basis. We know them, because we are witnesses of them in action. There is a line from the movie National Treasure: Those who have the ability to take action, have the responsibility to take action. I think that there are three sides to that coin, if a coin can have three sides. We have a responsibility to discern our gifts. Once we know what they are, we have the responsibility to use them for God's purposes. If we have the ability, we have the responsibility. I received a quote in my email yesterday, which said, "The identifying of gifts brings to the fore [a] large issue in our lives - the issue of commitment. Somehow if I name my gift and it is confirmed, I cannot "hang loose" in the same way. I would much rather be committed to God in the abstract than be committed to [God] at the point of my gifts. - Elizabeth O'Connor, from "Eighth Day of Creation"
Once people in our churches discover their gifts, we need to be prepared to give them an outlet to share them. Great things happen when people share their gifts with the church. Don't only does the work of God move forward, but we are inspired by those people who give of themselves to do the same. We want to help, we want to share, because we see other people helping and sharing. Just like J, who sees everything, we are witnesses of God at work in the world. If God gives us a task, he will give us the ability. To do otherwise, is un-God-like. He will equip us as he needs us to be equipped. If you know that you are doing what God wants you to do, then don't worry; you have, or you will have, the gifts to make it happen. That's God's way! Now, go build a house...or something! When my mistakes are wiped clean. Will hold nothing against me. Will relieve me of my guilt. All I must do is surrender. I will find that I have been lying to myself. Calling for him to return. Even though it never left me. And blew away, like dust. Finally, I told him of my mistakes. As if he hadn’t known. I gave up hiding them from him. “Please God, take this from me. Pulled me close, for he had never left. I pray that everyone may know and understand. I pray that all may find the love that he offers. As the heavy waters of pain rush upon them. And surround them with his assurances of home. Learn from this voice of experience. Surrender your pride, your stubborn nature. Draw near to him and find peace. The holes it tears in our skin. That we think blisters are our lot in life. Remember that tears are not to be our nature. And that shouts of joy await us. I was reading posts on some of the blogs that I normally track, and found one by Jay Voorhees of Only Wonder Understands called Light and Darkness: Reflections on John 9. I took some time and read it - I had just finished my devotion for the Lenten Devotional, and it was centered around light and dark. 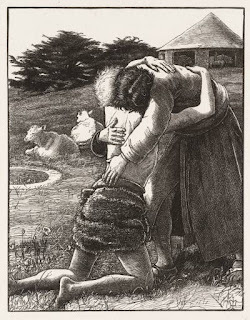 (By the way, the Lenten devotional is a poem, and it's posted right below this post). I recommend Jay's post; it's long, but worth the time. He talks about how we can be spiritually blind, and miss God in our lives. He gives several ways in which that can happen, but it occurs to me that there are even more ways -- in addition to the ones Jay lists -- that we miss God or his actions in the world. We assume that God is too busy to have anything to do with us. Do you ever feel that way? We get busy; we try to so many things at once that the lower priority items get lost. We assume God is the same way. He is not. We hesitate to claim that God is at work in our lives, because we think it sounds arrogant. Who are we that God would use us? Why would we be worth enough to be a tool at work in God's kingdom? We are worth everything to him, and the main way the work of the Kindgom is done is through us. Sometimes I think we just forget. We forget to pray, but we also forget to look around and notice what is around us. We just don't notice him. We fail to repent of our sins because we are afraid that God can't handle our sin. Isn't that silly? He already knows it, and is just waiting for us to KNOW it. I read this morning: We can't receive forgiveness because we don't ask for it. And when we won't experience forgiveness, we are much less likely to grant it. When we don't grant it, we are much less likely to experience it. Sometimes I think that so many other things get in the way, that the view to God is blocked. Walls between God and his children can be built of tradition (which Jay mentions), routines, busyness, idolatry, attempts at control, pride -- the list is endless. To see the light, to know the light, to experience the light is about an inner knowledge, a sense of understanding, and a willingness to recognize what is happening before you is a gift of God, even if it doesn’t conform to your understanding of the world. The day from the night. And planted his children in the garden. Hissing its darkness and manipulation. They have neither knowledge nor understanding. We could be walking around in darkness. And yet God did not leave us alone. Brought a tiny flame of light into the world. So often we ignored it. And pretended that darkness was our home. Love is no longer abstract. 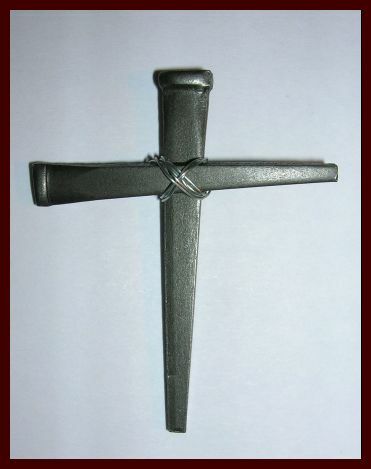 But was nailed to a cross. It was never his plan to leave us alone. He has never given up. He would never leave us in the darkness of death. And it is banished in the light of grace. And we have never been the same. When my mother was 16, her aunt taught her how to drive. She went for a visit, spent a week, and learned how to drive. My grandmother didn't drive, and my grandfather was working out of town at the time, so my aunt was "it." The only problem was that Aunt Sue didn't teach Mom how to back up. She could only drive forwards. When it was time to pull out of the driveway, Mom just turned in a circle in the front yard, and pulled out. It makes one wonder if she ever used the rear view mirror at all. When I started to drive, Mom and I went to an empty parking lot, and I learned how to back up. Mom was determined. I am an excellent backer-upper, thanks to this repetition to learn the skill. The Disciplines writer for Monday's devotion talks about life being like driving a car while watching in the rear view mirror. The significance of life's events only make sense if we look at them in the past. But that's no way to drive a car! In the book Prayer, Yancey says, "What is faith, afterall, but believing in advance what will only make sense in reverse?" God has cared for us in the past; faith is having the trust to believe that he will care for us in the future. "We have always done it that way," is not a faithful response. When we know God is holding us in the palm of his hand, then we are empowered to step forward in faith, not understanding the designation of the path we travel or the viability of the side roads that we might pass. There becomes no need to look a the past, but, in faith, we can examine the future with the trust that God will be there with us. We can save the reverse gear for leaving the driveway. Give it up. Or not. My question for today is to examine the role of a intentional commitment to a spiritual discipline -- a deliberate routine -- as compared to the spontaneous intrusion of grace. Are the two in opposition to each other? Like Bob, I am a Sunday school teacher, and I have certainly experience what he describes. 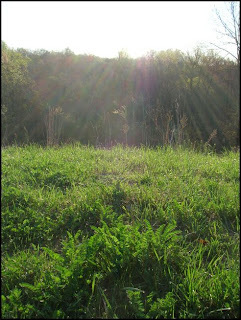 There are times, when I am teaching, that I see God from an entirely different angle. My "new view" may be triggered by comments made my members of the class I am teaching. I may see something new as I prepare for the lesson. Some of the most amazing revelations of grace occur as I am teaching. There have been times when I have a thought that I have never touched on before, but which arrives, like a gift, as I am speaking. A rabbi taught that experiences of God can never be planned or achieved. "They are spontaneous moments of grace, almost accidental." His student asked, "Rabbi, if God-realization is just accidental, why do we work so hard doing all these spiritual practices?" The rabbi replied, "To be as accident-prone as possible. Aha moments catch me be surprise. A sense of gratitude, a ping of compassion. But they catch me, I have learned, only when I am looking for them. I think we can find God more often when we are closer to him. I think we will be soaked in his grace more often when we are standing close to the source. I can understand what Yancey means when he says we need to be spiritual disciplines to become accident prone. I write this blog. I do it everyday, even though there are times when I would rather not. Some days there is no immediately apparent topic for a post. Some days I have to dig to find the topic. It's a discipline. It is a way that I try to be accident prone. I think it may be that "routine" work -- something picked up because of Lent -- that I have missed. It doesn't help that I keep getting asked, "So what did you give up for Lent?" "I've given up answering questions like that!" 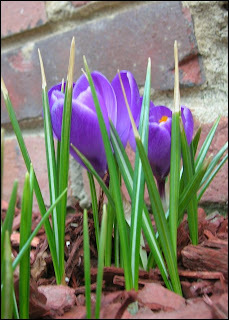 Image: Crocuses in our yard. SPRING! I was walking through the hallway at church a few weeks back -- it was the first Sunday of Lent. Our associate pastor was walking by. She was collecting a needed ingredient for her Children's Moment that day -- lint. Dryer lint. To be precise, she was not collecting it from me, but from the dryer at the church. I was trying to joke with her that she had lost her lint, but instead I told her that she had lost her lent. Sometimes I think this season that I have lost my lent. I'm involved in a couple of different lenten projects at our church -- our lenten devotional and prayer vigil. I am finding them to be wonderful blessings -- in the preparation and in the implementation of them. I was privledged to go to the community Ash Wednesday service and our own Ash Wednesday service at church. I've mentioned before that I'm team-teaching a Wednesday night class as well, which has stretched through Lent. It's not that I've been uninvolved at church during lent. The problem seems to be that I never took the time to make any kind of Lenten commitment. I haven't given any thing up or taken anything up. I haven't stopped doing what I usually do, but I'm not sure that I've paid proper attention to Lent. Have I lost my Lent? When I get to Easter, will I have grown spiritually in any way? Have I made any deliberate efforts to examine my life and repent of my mistakes? At this point, I would have to say the answer is no. "'Sir,' the man replied, 'leave it alone for one more year, and I'll dig around it and fertilize it. If it bears fruit next year, fine! If not, then cut it down.' "
What I have never noticed until this week is that this passage is one of grace. The tree has not been producing fruit. It has done nothing to earn its place in the garden. And yet, the gardener is not willing to give up it this tree, yet. He persuades the landowner to give him another chance with the fruitless tree. He has no reason to do that, except that he feels a need, I think, to try to save the tree. Even if perhaps it looks hopeless. Even if the tree has been fruitless, so far. Even though the time spent with the wayward tree might be more profitably spent doing something else. Still, the gardener takes the time to invest in a seemingly hopeless situation because he believes in the potential of the tree, and because he's just not willing to give up yet. There is definitely grace in that story -- grace that I had always missed. I know that there are various opinions about the advertising slogan for the United Methodist Church -- "Open Hearts. Open Minds. Open Doors. The people of the United Methodist Church." I, for one, like it. Do I think we always live up to it? No, of course not. But I like its ideal. I like the goal that it sets for us. I do think that we have to be careful as we operate as a church under this standard -- it's easy for us to say one thing, and then do another. But, idealistically, I really like it. We have a worship service at our church on Thursday nights called Common Grounds. As it has developed, it has become a weekly event that ministers to the homeless and marginalized of our downtown area. We feed sometimes over 100 people each Thursday, and we feed their spirits with worship. The danger in this is that sometimes we take a step back, and we seem to say to ourselves, "Look how great we are doing. We've opened our doors and our minds to those who live on the street." Sometimes I worry that we say it in a way that implies that we have opened our doors so that the Thursday night congregation can have access to God for an hour -- as if we keep him in a box in the social hall, and are inviting people to come and meet him. I think we are prone for forget that God dwells with "the least of these." When we open our doors, our hearts and our minds, we are opening them for God to enter. We could keep our doors and minds locked, and assume that God is with us, when he is really standing on the sidewalk, knocking on the door. We aren't keeping God to ourselves and doling him our in small, rationed bits. It is only when we open our doors, our minds and our hearts that we invite God to enter. Too often we assume just the opposite. 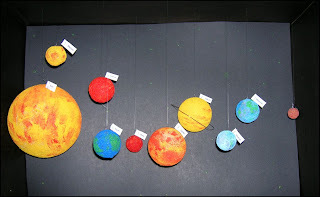 One 3-D model of the solar system, built for 50 extra credit Science points. The little white flags are planet labels. Don't all planets come with labels? Our son, G, is growing. It seems that every time I turn around, he is taller. The way our stairway is built, there is ceiling at the bottom. Steve, who is 6'4", knows, habitually, to duck when he comes down the stairs. Every once and a while, he will hit his head, but not very often. This morning, G was running down the stairs behind me as we were getting ready to leave the house. I heard a groan, turned around, and found him sitting on the stairs, holding his head in his hands. Apparently, he hit his head on the ceiling as he came down the stairs. He's taller, and he's never had to duck before. Looks like he's going to have to change his habit. Last night in class we talked about the passage in Matthew 13:24-30 and 36-43 about the wheat and the weeds (or thistles, in the Message). It is a parable which compares the Kingdom of God to wheat seed that a farmer has planted. 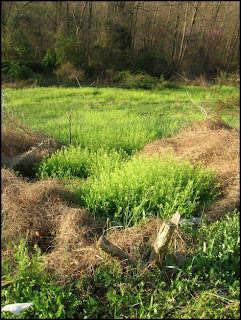 The wheat grows, but along with it, weeds or thistles sprout up. We talked about what that means, and how it defines the kingdom. 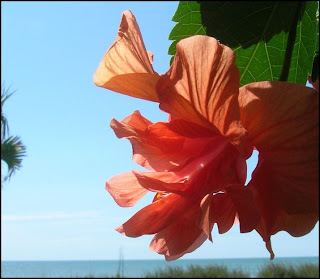 One question arose which the parable doesn't really address -- can a thistle become wheat? Can there be a transformation of the very nature of the plant so that, even though it sprouted as a weed, it can, through grace, become wheat? Our conclusion was that, if we were talking about people and not plants, then, yes, transformation is possible. The Lenten devotion that was sent out today from our church was about Zacchaeus (Luke 19:1-10). In addition, the sermon at our Common Grounds service tonight will be a first person monologue from the tree-dweller, himself. It's a good story. Take just a few moments to read it again. Then Jesus entered and walked through Jericho. There was a man there, his name Zacchaeus, the head tax man and quite rich. He wanted desperately to see Jesus, but the crowd was in his way—he was a short man and couldn't see over the crowd. So he ran on ahead and climbed up in a sycamore tree so he could see Jesus when he came by. When Jesus got to the tree, he looked up and said, "Zacchaeus, hurry down. Today is my day to be a guest in your home." Zacchaeus scrambled out of the tree, hardly believing his good luck, delighted to take Jesus home with him. Everyone who saw the incident was indignant and grumped, "What business does he have getting cozy with this crook?" Jesus said, "Today is salvation day in this home! Here he is: Zacchaeus, son of Abraham! For the Son of Man came to find and restore the lost." Zacchaeus had been a thistle. He met Jesus, and was transformed into wheat. Change, even though it is not always comfortable, and at times is even hard to fathom, can happen. Transformation is possible. Even from thistles to wheat. Even from tax collectors to faithful disciple. Even from a small boy to a gangly teenager to eventually a man. Even from who I am to who God created me to become. In our Wednesday Evening class last week, one of those attending asked about the cause of disasters such as Hurricane Katrina. Did we think that God brought about events such as this in order to teach us a lesson? Was this a "knock in the head" to try to point out our sins to us, and to motivate us to change? Why is it, do you think, that we have a deep need to assign blame, even if the one upon whom we are placing the blame is God? We blame each other, we blame ourselves, we blame God. In reality, there are some events that just happen. Accepting that not everything has an explanation, that somethings events just "happen" isn't neat. It doesn't appeal to our sense of order or our sense of fairness. We don't like that. I do think it is better than believing that God sets out to "teach us a lesson" by sending a horrible disaster to a city. What about the rest of the passage? What about the idea that "unless you repent, you too will all perish."? What is the end result of repentance? Could it be that Jesus is saying that unless we repent, we will die far away from God? That if we repent, we will be closer to God? None of that protects us from disaster, but it does bring us closer to where we need to be, come what may. Whenever I teach a Sunday school class about forgiveness, this is the question that people ask. Is it really true that to “forgive is to forget.”? When you forgive someone, you give up the right to hurt them back. You give up the sin of vengeance. We all know it, even if we only practice it in our minds. We imagine all kinds of scenarios in which the person who hurt us is hurt back. When we forgive, we let go of this kind of sin. We forget about vengeance. He goes on to say that this does not mean letting go of justice. Justice in itself is self-limiting – it is, at heart, a pursuit of fairness. Vengeance is not self-limiting. It is by nature, “insatiable.” If forgiveness always involved forgetting, then there would be no consequence to wrong-doing. The kidnapper would not go to jail, the abuser would never be stopped. We forget our desire to hurt someone else when we forgive them, but I’m pretty sure that we don’t forget the action of the person. Ortberg says that we have reached the third state of forgiveness when we truly wish for the best for the person who has hurt us. He says, “When you want good things for someone who has hurt you badly, you can pretty much know that the Great Forgiver has been at work in your heart.” We forget that we wished that the person would slip on a banana peel, hit his head, and all of a sudden realize the immense hurt that he has done, and spend the rest of his life regretting it. Instead, we look at the person, and see a child of God. We wish for that person to be close to God. We wish the best for him, and we will even pray for that person to receive God’s grace. So I think Bob is right. Forgetting can sure be a part of forgiveness. As Ortberg says, we don’t have a memory problem. What we have is grace. I'm still reading John Ortberg's book "Everybody's Normal Till You Get to Know Them." I'm in the third section called "The Secrets of Strong Relationship." The chapter I'm currently reading is about forgiveness. Forgiveness is not the same thing as excusing. If an action is excusable, then is actually doesn't require forgiveness, does it? If, for example, someone is speeding because he is trying to get to the hospital before his child is born, then his action is excusable, but he doesn't need forgiven. If you think about that, then we shouldn't be waiting around for someone's actions to be excused before we forgive him. Forgiveness is not forgetting. We talk about that one alot. Are we required to forget something that someone did to us when we forgive him? Ortberg's point is precisely that the two actions are not the same at all. He says, "Forgiveness is what's required precisely when we cannot forget." Forgiveness is not the same thing as reconciling. 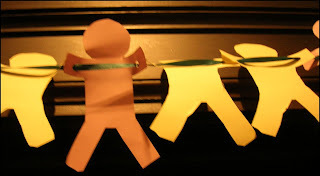 Reconciling requires action by both people. I can't reconcile with someone who does not which to reconcile with me. I can forgive him. Also, there are times when I would forgive someone, but not reconcile with him. Think of the abused wife, who finally is able to forgive her husband, but in no way should be reconciled with him. So if forgiveness is not excusing someone, or forgetting the hurt or reconciling, then what is it? I like Ortberg's thought that forgiveness is what is required when excusing or tolerating or accepting are not big enough to handle the job. It's hard work. It isn't easy. It's difficult -- so difficult that there are times that it is only by the grace of God that we are able to do it. 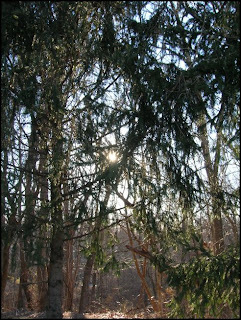 Image: Trees and sun at the VA this morning. Our district superintendent wrote a devotion for our church's Lenten devotional for today which I really liked. If you want to read it in its entirety, go here. We are given the privilege of scattering those seeds wherever we can – not paying attention to what we think are the proper or good conditions. We have no way of knowing how the “receivers” will listen (or even if they will listen), but how can they ever hear if no one is sharing the word with them. We don't get to choose where to sow the seed. It's not our job to say, "That person would never be changed by God's word." It's not our seed in the first place. God provides the perfect seeds, and we are given a limitless supply of them. Our job is to go out and spread them, and no rationing is allowed. We may never know the result of our sowing. Sometimes we'll get to see the seed take root and grow, but sometimes we don't get that privledge. Just because we don't see the end results, doesn't mean there isn't one. So picture it. An analogy. Someone has come to our doorway, and left us with the perfect bag of grass seed. It is all great seed; not a weed in the bunch. We hop in our car, and drive across town, until we reach the place that we hadn't expected to reach. We jump out, and spread the seed in someone's yard. We aren't sure if the ground here is good for this project or not -- we just spread the seeds. And then we leave. Did the seed germinate and grow? Did our work make any difference at all? We usually do not know, but God does. He cares for the seed, and cares for the sower. And sometimes the words germinates. It's late tonight, and I really have no thoughts, so instead I am going to share a conversation that J and I had. On Thurdsay, J went to the capital to be a page. He as telling us about it today. "When we got there, we had to wait a long time for page training." The person who ran it told them that there are 2 divisions to the legislative branch -- the "House of Delicates" and the other one, whose name he couldn't remember. I wish he could! While they were there, they went to one of those stores where you can build a bear. "Mom. It was stange. They had bear boxers for them. And bear thongs." Where did he hear about thongs? Allow me to rest in your presence. That keep me from your grace. The prayer above was written as I read the Yancey book, Prayer. As I finished chapter 20, I wrote it in the margin at the end. Listening is an art, and I must learn to listen to God. Our job is to remain attached, to abide. Without prayer, my attention moves to my own preoccupations. The power of prayer has helped recreate me. Some mornings my prayers are connected to God, and they take me closer to God, as if I am on wings. Other times, nothing like that happens, and I have to struggle to concentrate, to even form prayers. I was in the little chapel once in the church in Ashland, with Steve, JtM and MT. We were taking a few moments to prayer before a worship service. I don't even remember what the four of us prayed. What I remember the most is that we were in the presence of God. He was with us, and the most important part of our prayer time together was just that we "showed up." The most important part was that the four of us had taken the time to come together, and that we had met God in that room. My reunion group has started a new tradition. At the end of each meeting, we join hands and pray. I have been surprised at how easy it is -- by easy, I mean relaxed. It truly feels as if we have invited God into the room, he has pulled up a chair, and we are spending time with him. During the first time we did this, I remember laughing. Joy. How great is it to find joy in prayer? When we gather together and experience the presence of God -- the joy of God -- I think we can safely assume that God is pleased. We were having a discussion in class last night about the Ascension. One of the members of the class said that the sentence in the chapter we were discussing which really struck her was, "By ascending, Jesus took the risk of being forgotten." I knew what she meant -- it was one of the thoughts in Yancey's Ascension chapter which also struck me. As we talked, another class member said, "Don't you think he (Jesus) knew what would happen? Don't you think he knew how we would react? He's God; he knows things." Right on the heals of that sentence, another class member said something that I thought was very profound. "Sometimes it's risky to be God." Sometimes it's risky to be God. I think that's true. I think it's much more true than the idea that God and Jesus took no risks in leaving us behind. I think it was a risk. I think it could have gone a different way, and we might have forgotten him. Why do I think so? God is God, and he does "know things." I believe, though, that he has given us free will. We are able to choose one action or another. He set it up that way; it has to be that way. Unless we can choose to love, then we cannot love. Love is not love if it is forced. Love always involves risk, don't you think? There is always a risk of rejection. There is always a risk of being forgotten. It is so very much like the God I have come to know to love us so much as to give us the freedom to love him, too. Secondly, it is so like us to forget him. We do it all the time. I think that it is much more likely that we would have forgotten him that we would have remembered him. Thank God we have remembered (for it is by grace that we do remember). It was a risk. It still is. The class member who brought up the idea that the ascension was a risk, also mentioned that it is hard to remember that God is with us. When we are in the valley -- when we are afraid, or lost, or when we feel alone, that it is hard to remember that he is with us. He is God, and he knows things. He knows how hard it can be. That's why he left us each other. That is one of the reasons that we have the Body of Christ, so that we can remind each other. So that we do not forget. Image: The image is of the Special Metals building with a Christmas wreath on it. It was taken on Wednesday -- yesterday. I post it because there are a few people who will understand why that makes me happy!